We think that Friendly Street is lovely. There is an incredibly well preserved set of early Victorian terraces on the west side of the road, which are wonderful and we also happen to think that our local public houses are treasures worth preserving. 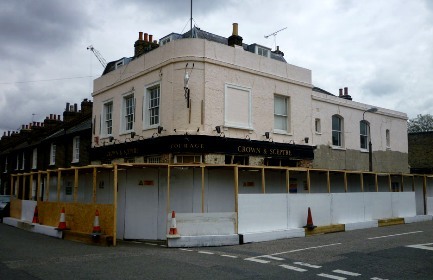 We were therefore very sad to see that a ‘not-so-friendly’ developer, who has been busy converting the Crown and Sceptre pub into flats, had started to remove the beautiful original tiles from the front of the building. 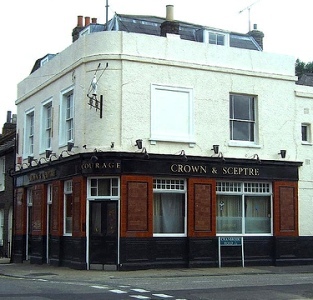 Knowing that part of the planning consent for this development required the exterior of the building to remain as its existing appearance, we approached the foreman who informed us that the tiles had to be removed “otherwise it would still look like a pub!” The next day all of the tiles had gone completely. To cut a long story short, and after a good deal of communication with Lewisham’s Planning Enforcement officers, the developer has turned out to be friendly after-all and has agreed to reinstate the tiling. However, the original tiles are now in landfill so we will be keeping a close eye on the development to ensure that the quality of the new replacement tiles and workmanship is of the standard required to ensure the building is truly returned to its original state.